Millie: Was this all my fault?Kaine: Of course it was!Millie: I'm sorry. All I was thinking about was getting the groceries. The darker tone established on disc four continues to play out as we move into the second to last disc, and another five episodes in the Lost Universe series. From the get go, the plot drives forward, as the discovery of another Lost Ship will change the situations of all our characters for the next arc in the story. The action level increases, as we see many more confrontations emerge, which also means an increase in the amount of CGI work. More of Kain's background is exposed, as is that of Nightmare, as we are set up for the final collection of episodes. Buried beneath the city of Thitios on the planet Ethona, the Universal Guardians keep watch over an excavation site where a Lost Ship has been uncovered. However, the arrival of representatives from the Gazer Concern arrive with orders that they have been put in charge of the expedition, one that will put Nightmare in an unstoppable position. Back at headquarters, Nina learns that Rail has been charged as a spy, and his capture is ordered. Meanwhile the Swordbreaker heads to Ethona to investigate the discovery as well, as a Lost Ship falling into the wrong hands could have devastating consequences. Kain and Millie head to the surface, but after ditching his companion, Kain runs into his old foe Kali, who wants to put an end to his snooping. The reunion is interrupted by the arrival of Rail, who seizes the upper hand, and the ship, in Universal Guardian Explodes.With the events following Rail's capture of the ship, both he and the Swordbreaker crew are branded as traitors, so Kain and the others on the run from both the allied forces and Nightmare, who begin mounting offensives throughout the galaxy. 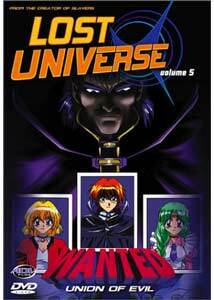 The Universal Guardians are no match for Nightmare and their Lost Ships, leaving Kain to try to take them on singlehandedly, but even he has met his match with these deadly opponents who want nothing more than to rid the universe of the trouble consultant. I have mixed feelings about this series. While the action and story development we've seen over the last disc is creating a more cohesive plot, much of what I found attractive in the first few discs—the crazy humor—has been abandoned, or has lost its intensity. The move into multi-episode story arcs does do away with some of the filler, but also lowers the opportunity to have the kind of character interactions that made the opening discs so enjoyable. I would have been happy if they simply kept up some of the running gags, but these have also been downplayed to the point that they don't have the same uplifting momentum they once carried. That said, there is still a decent storyline being developed, but this is now a different series from where we started. The dub continues to radically alter the script, eliminating what little is left of Millie's kitchen comedy. Image Transfer Review: Image quality is consistent with the past discs, which is slightly below par compared to more current releases. There is a fair amount of grain, especially in dark blue scenes, and some places continue to be a little less focused than others. There is some aliasing and interlace issues, but nothing seriously wrong here, just the evidence of an older transfer. Audio Transfer Review: Stereo audio is on par with previous releases. Directionality is used diligently, especially during battle sequences, and dialogue is easily discernable on both the Japanese and English tracks. There is still the odd bit of distortion present on voices in the Japanese track, but it isn't very frequent. Extras Review: Disc five once again contains more front-loaded, but skippable trailers for Farscape, Shadow Raiders, Reboot, Spriggan, Gasaraki and the ADV mix trailer. Like the other discs, the main menu also allows access to the trailer reel, though you'll need to chapter skip to the individual titles. Five chapter stops per episode are available from the scene selection menu. While I'm still enjoying the series, Lost Universe has made some fairly substantial changes in tone over the last set of episodes. There is a better developed story, and more pieces to the puzzle are unraveled, but this comes at the expense of the wacky comedy that drew me into the series in the first place. That isn't to say the humor is totally missing, just that even in the few breaks presented, the weight of the surrounding drama decreases its levity. Heading into the final disc there is a more somber atmosphere, one I hope will pick up a bit before the series reaches its conclusion.